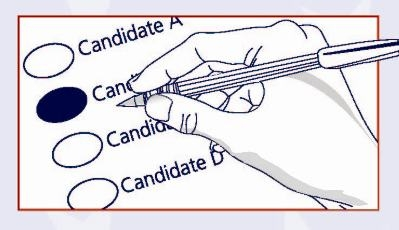 When voting at your precinct or during early vote use the special pen provided, otherwise if voting by mail (absentee) use a black or blue pen, Putnam County voters fill in the oval on their paper ballot, to the left of their choices. After marking the ballot, the voter inserts the ballot into the secrecy sleeve provided to prevent exposing their choices. If voting at your precinct or early voting deposit your ballot into the tabulator. The ballot is then tabulated immediately. If voting by mail (absentee) insert the secrecy sleeve with the ballot into the certificate envelope provided, seal and SIGN. Return the sealed and signed certificate envelope to the Supervisor of Elections office either in person or by mail. All Vote by Mail Ballots must be received in the elections office by 7:00 P.M. on election day. Upon receipt your signature will be verified. The absentee ballot will be opened and tabulated by the Canvassing Board during a scheduled meeting. Please remember to keep your information (name, address, etc.) and signature up to date to prevent delays in your voting process. To update your information click here.